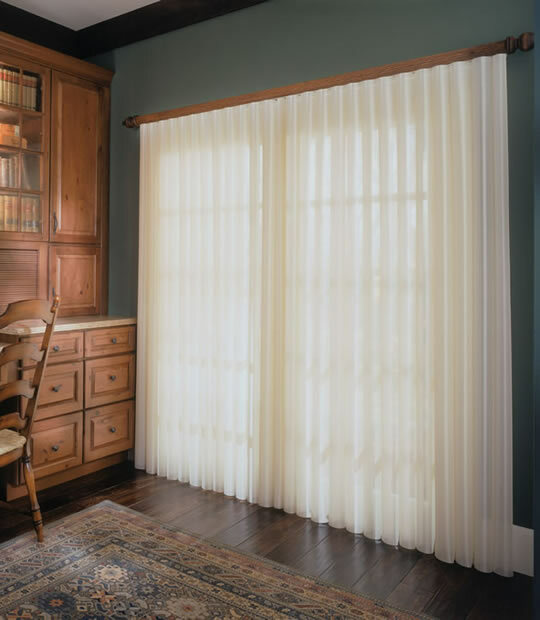 Drapery Sheers are engineered with a patented hinged fabric that is exclusive to Comfortex. Available in many colors and patterns, Drapery Sheers offers a look for any decor with selected patterns available with coordinating Horizontal Sheer Window Shadings. Drapery Sheers' soft fabric sheers billow to create a window treatment that is unsurpassed in both function and beauty. All Drapery Sheers are light diffusing. Opaque room darkening vanes are available to increase room darkening capabilities. Choose from room darkening or light filtering vanes. The light filtering vanes provide maximum closure and privacy while retaining the light filtering properties of the sheer. The room darkening vanes provide maximum closure and privacy as well as light blocking control. Ballet's head rail track system assures smooth and quiet operation for a lifetime. A full range of fabric rotation and privacy options is assured with the innovative cord and chain mechanism. Its compact design is ideal for sheers and blinds that are layered beneath curtains or top treatments as part of a drapery ensemble. The valance conceals the track system and provides a designer's touch to the sheers or blinds. This is an alternative wood valance style that covers the head rail track system, giving it the look of a traditional drapery rod, and adding visual impact to your blinds or sheers. Available in a variety of colors & styles. You can choose from a fascia, a valance, or a matching fabric scarf (pictured below) for a unique way to conceal the track system. You can stack vanes to one side (side stack) or both sides (split stack), depending on your preference and the design of your home. Designed for any of today's windows, these window treatments can accommodate windows and sliding glass doors up to 192" wide. Coordinating Windows: Coordinating fabrics in the Envision Roller Shade Collection. Minimum Width: 12" Maximum Width*: 192"
Minimum Length: 24" Maximum Length: 120"
Minimum Width: 20" Maximum Width*: 192"
Minimum Width: 12" Maximum Width*: 144"
*Maximum ordered width for a side mount is 48"
Width and height may vary +/- 1/8". - Valance: ordered width plus 1"
- Valance returns: will measure 7"
- Minimum casement depth: 2 1/4"
- Minimum casement depth, fully recessed: 6 1/2"
- Minimum mounting surface height: 1 3/4"
- Recommended width overlap, per side: 4"
hang to the floor: 4"
hangs to the floor (deduct before ordering): 1/2"
- Minimum mounting surface depth: 1 3/4"